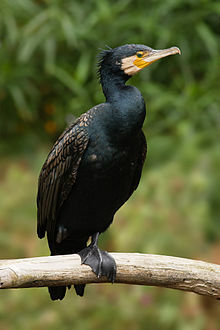 The black scart (Phalacrocorax carbo), an aa simply kent as the scart, gormaw, or lorin, is a widespread member o the Phalacrocoracidae faimily o seabirds. The genus name is Laitinised Auncient Greek, frae φαλακρός (phalakros, "bauld") an κόραξ (korax, "raen"), an carbo is Laitin for "charcoal". ↑ BirdLife International (2012). "Phalacrocorax carbo". IUCN Reid Leet o Threatened Species. Version 2013.2. Internaitional Union for Conservation o Naitur. Retrieved 26 November 2013. ↑ Jobling, James A (2010). The Helm Dictionary of Scientific Bird Names. London: Christopher Helm. pp. 90, 301. ISBN 978-1-4081-2501-4. This page wis last eeditit on 4 Mairch 2019, at 14:29.